Meryl Comer’s statements help explain why she’s emerged as a leading advocate in the fight against Alzheimer’s and dementia. I don’t know how she’s found the time or the energy: I’ve yet to come across anyone who’s cared for their loved ones at home as long as Meryl. She’s taken care of her husband for 22 years. And a decade ago her mother, now 98, moved in with them. Both were diagnosed with Alzheimer’s, he with early onset and she with the more classic later age. Meryl has been caring for them round-the-clock with a small, rotating team of nursing aides; she slows the financial bleed by pulling a solo, 12-hour shift. She saw telltale signs, as did Harvey’s colleagues, long before he was diagnosed with early onset in 1997, when he was 57. But she couldn’t figure out what was going on. He subsequently entered The Johns Hopkins Hospital under an assumed name. “I didn’t want his reputation ruined.” He was there for 2-1/2 months while Meryl tried to find him an assisted living facility (ALF). “But no one would take him. He was too young, too strong, and too dangerous. It took four orderlies to hold Harvey for a blood draw.” Moreover, the ALF cost $15,000 a month. They were without long-term care insurance so Meryl, in her prime and several years younger than Harvey, reluctantly decided to give up her TV career to care for him at home. Like many caregivers, Meryl searched for any possible way out of this crisis. “I even went to Europe to get a med before it was FDA-approved in the U.S. It cost $200 a pill. I couldn’t buy many but got enough to test to see if it might work. It helped slightly, but not for long. This thumbnail sketch of their story offers insight into Meryl’s passionate drive that a cure be found now! for Alzheimer’s—both for the ones living with the disease and for their caregivers. Any family going through such stress would want a cure, but few persons are driven to the lengths of Meryl’s pursuit. 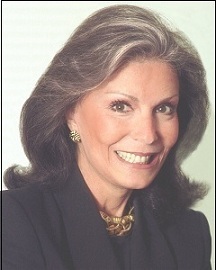 Since 2007, she has served as President and CEO of the Geoffrey Beene Foundation Alzheimer’s Initiative. (That’s the Geoffrey Beene, the clothing and fashion designer.) Meryl also is a founding member of the UsAgainstAlzheimer’s movement and a co-founder of its network offshoot, WomenAgainstAlzheimer’s. She’s been a driving force behind the group’s “A-LIST”. (More about that later). Meryl also serves as a co-Principal Investigator of the The National Alzheimer’s & Dementia Patient & Caregiver-Powered Research Network, which works in conjunction with the Mayo Clinic. In that role, she helps steer their research to include not only the patient’s wellbeing but also the caregiver’s. “Public advocacy has saved my life,” says Meryl when asked why she’s poured so much of herself into these often time-conflicted roles. But Meryl’s advocacy is not just about her. This stigma, she says, is a major reason why half of those living with dementia or Alzheimer’s are not diagnosed, or are still misdiagnosed. She points to a study commissioned by Merrill Lynch in which “people cite Alzheimer’s as the scariest health condition of later life (54 percent)—more than cancer, strokes, heart disease, diabetes, and arthritis combined.” Alzheimer’s and dementia affect not only the persons living with it and their primary caregivers, but also their children and grandchildren. Their friends, too. Under Meryl’s direction, the Beene foundation launched a virtual study into caregiving’s long-term impact on caregivers. “We found that more than half the caregivers who responded were operating at less than 50 percent of what is considered a normal cognitive level.” Anecdotal information also indicates that many caregivers die before their loved ones. One of Meryl’s pet projects is the UsAgainstAlzheimer’s “A-LIST”. The volunteer members on this list comprise a first-of-its-kind community who live with, or are at risk for Alzheimer’s—as well as mild cognitive impairment, and other dementia. The group also includes care partners, both current and former. Meryl pushed the concept when it became apparent that clinical research organizations were unable to find enough trial participants in a timely manner. In closing I asked Meryl: Would you have done anything differently over these past 22 years? What trait do you see in yourself that you didn’t realize two decades ago? Thank you, Meryl, for being willing to share your story, to describe your advocacy work, and to pass forward your hard-earned insights. Your story, your drive, and your caring encourage an untold number who seek ways through their own crises. PS1 As usual, feel free to forward this post to your friends and family. If you’d like to sign up for my blog, it’s free; just click here. PS2 You may have seen this before, but if you haven’t it is well worth checking out. My friend Bob Beckett in Nashville has been caring for his wife for over 12 years now. He’s compiled the most comprehensive list of resources for dementia and Alzheimer’s I’ve seen to date. I wish I’d found something like this when my wife Martha was diagnosed in 1997. PS3 My apology if you’re tired of seeing me promote this Alzheimer’s stamp. But if you don’t know the story behind this stamp’s existence—it’s an interesting one—you can check it out here. By now you surely know that the net proceeds of this 65-cent stamp go to the National Institutes of Health for Alzheimer’s research. 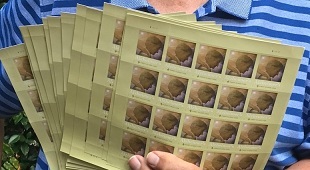 As of February, the 15th month since its issue, over 6-million stamps have been sold, raising $840,000. Join me and thousands of others and Help Stamp Out Alzheimer’s. PS4 My book A Path Revealed: How Hope, Love, and Joy Found Us Deep in a Maze Called Alzheimer’s can be ordered from any bookstore or found on Amazon. I share our family’s 17-year odyssey of living with Alzheimer’s. My high-energy wife Martha was 50 when diagnosed; I was 52. Our children were in high school and college. But Alzheimer’s is not the focus of our story; it’s the context. The focus is the spiritual odyssey that unfolded before us, sometimes in strange and surprising ways, other times in the most ordinary of ways. Older Post"When You Took Care of Your Mom, You Stole My Joy"